Take grated bottle gourd and remove excess water by pressing it with hands. Take a microwave safe bowl. 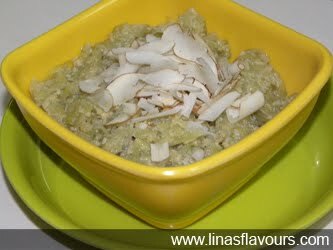 Add ghee and grated bottle gourd, mix it and cook it for 4 minutes. Add condensed milk, sugar, khoya, cardamom powder and cook it for 5 more minutes. Garnish it with almonds and serve it hot. Take a pan and heat ghee. Add grated bottle gourd. Saute it till the water evaporates. Add condensed milk, sugar, khoya and sauté till it is dry and ghee starts leaving on the edge.